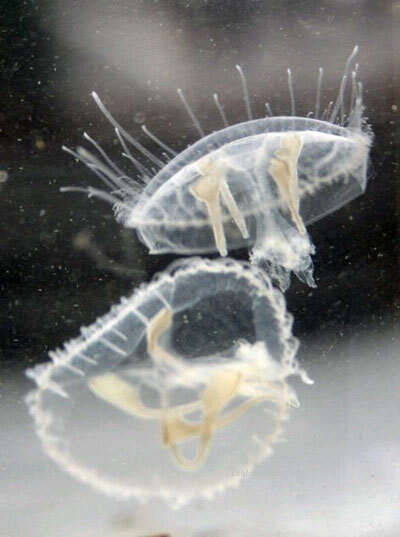 On May 15, the peach blossom jellyfish, reputed as the "living fossils of the water" or "giant pandas in water", appeared again at the Jiushan Cave scenic spot of Fengyang county. This was the sixth consecutive year since they were first spotted in 2007. Since the outset in 1990, the scenic area has attained sustainable development by focusing on protection and the rational utilization of ecology. Peach blossom jellyfish, also known as the peach blossom fish, is the most primitive and the lowest invertebrate coelenterate on earth. It has existed 650 million years and is called a living fossil of evolution. Their living environment is highly demanding (pH value of 6.5 with temperature from 20 C to 30 C). As their living body is rarely seen and is difficult to be made into a specimen, they are listed as the world’s "extremely dangerous living beings".